HP Magenta #80 Print Head/ Printhead Cleaner (C4823A) : Disk-O-Tape, Inc.
HP-engineered to work as a modular ink system with HP 80 Ink Cartridges. 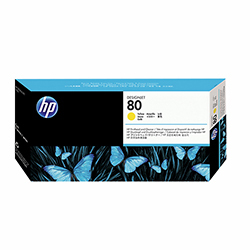 Designed to work with HP Designjet 1000 series printers. Excellent print speed with HP's Jetexpress technology. Built-in smart chip for outstanding print quality without guesswork. Manufacturer Warranty Until the “Warranty Ends” date has been reached or the warranted usage limit has been reached, whichever occurs first. Page yield footnote Color line drawing in fast mode on HP Bright White Inkjet Paper, 5% coverage.